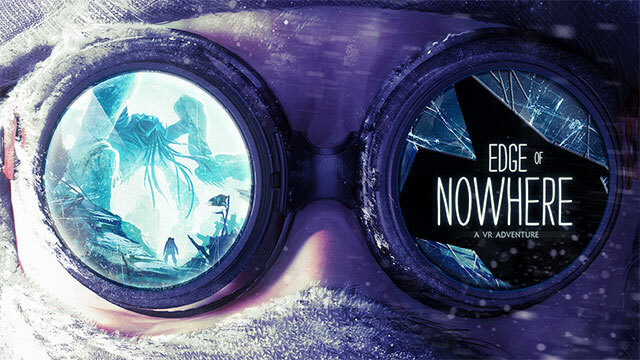 Insomniac Games has announced Edge of Nowhere, exclusively for the Oculus Rift. Insomniac CEO Ted Price took the stage at Oculus’ press conference to announce the third-person action adventure. Edge of Nowhere is a VR third-person action-adventure from acclaimed independent developer Insomniac Games. Travel to the far reaches of the Antarctic mountains in search of a missing expedition team. What appears to be a rescue mission takes a turn as you venture into the deep unknown, and discover a surreal world that will test your wits and sanity. Scale towering mountains and use makeshift weapons to survive and avoid descending into madness. In Edge of Nowhere, nothing is what it seems and the unexpected lurks from all sides. Price explained that Edge of Nowhere has been designed for VR from the beginning. “You’re surrounded on all sides by the unexpected, and nothing is as it seems,” says Price. Insomniac’s Ted Price didn’t provide any release information, but judging from what he talked about, and what was shown, Edge of Nowhere will provide a truly immersive environment and experience, that seems to suit the VR medium perfectly. Insomniac Games have released the first trailer for the upcoming Ratchet & Clank “re-imagining”, set to launch alongside the movie in 2016. The trailer features some jaw dropping gameplay footage. Ratchet & Clank will launch for PlayStation 4 in Spring 2016 alongside the animated film of the same name. The film will be released by Focus Features in the United States on April 29, 2016. We will be seeing more of Ratchet & Clank at Sony’s E3 2015 press conference on June 15, and we will be bringing you any new information as soon as it becomes available. The post Edge of Nowhere – A VR Adventure – Reveal Teaser by Archie Paras appeared first on WCCFtech.